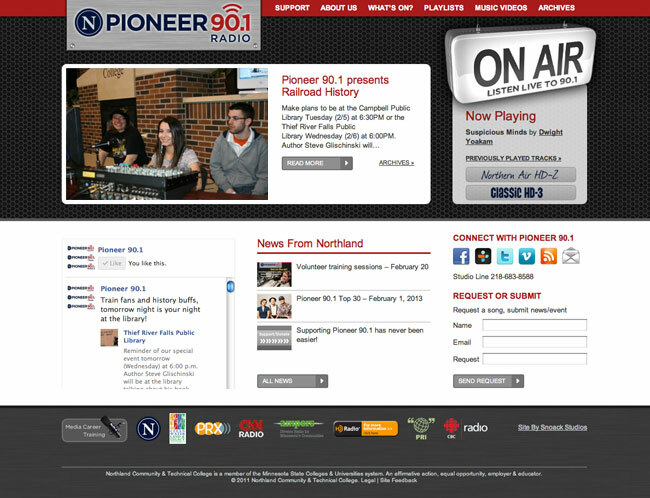 Pioneer 90.1 is a college radio station, with Northland Community & Technical College in East Grand Forks and Thief River Falls, MN. They wanted the site to reflect the music they play, which is mostly Adult Alternative, but it had to work for many different types of music because their programming is diverse. Being a college station, we also wanted to add a youthful aspect to the site so it appealed to their mostly young audience. We used some great textures to give the site a fun look including a speaker texture in the header area. We added some other fun elements like the large on-air sign that features the song that’s being played currently so you can tune in if you like what’s on. The site is rich with tons of great features that make it very user-friendly and relevant for users.